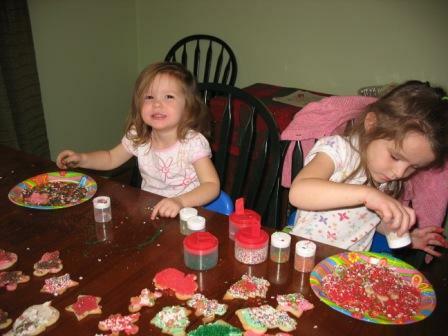 Today the girls and I decorated cookies to put out for Santa. I made the cookies on my own yesterday to cut down on the mess and stress for me. I don't know why it is that sometimes my expectations are sooo wrong when it comes to the kids. I thought we could decorate cookies and have fun and in the end have some pretty cookies for Santa. I should have thought about the fact that the kids are 2 and 4... and they love sprinkles and making a big mess. Every one of the cookies had to be shook off before putting them away because they have soo many sprinkles on them. They are going to be sooo crunchy. Oh well... I hope Santa likes sprinkles. I've been so busy the last couple weeks... It's been crazy. We've had playdates and a birthday party. A Christmas get together and an outing to see the nutcracker ballet. Work has also been crazy busy... So I've been a bit MIA. M turned 4 over the weekend. I can't believe how big she is... We joke about her being 4 going on 14. She's dramatic and whinny and curious and smart and wonderful all wrapped up into one. She's my drama queen and has a little more sass then I signed up for. She asks a ton of questions and is very smart. She can write all her letters and numbers. She knows how to spell her name and many of her friends names. She can read a few small words. She likes to pick out her own cloths and can get herself completely dressed in the morning. In honor of her birthday, instead of having a party with all her friends, we had a cookie making playdate. We invited 2 of her friends over and made cut-out sugar cookies. The girls had a lot of fun and made a *big* mess. We also had a family party this past weekend where we ordered pizza and made ice-cream sundaes. Both girls loved the ballet when we went to see it. They sat on G's lap all engrossed in the music and dancing. M wants to go to ballet class again. J just finished her swimming class. G said that she, with the aid of 2 swim noodles, can pretty much swim on her own. She loves the water and, since she doesn't know that she's a little kid, thinks that she can do it herself, so she almost can. I am officially ready for Christmas. I have all my shopping done and all my gifts wrapped. I love Christmas, I just wish the girls birthdays weren't so close... It's just everything all at once. I have to plan two parties as well as Christmas and it's overwhelming. With the birthdays behind us I'm ready to enjoy Christmas and a little time off work.